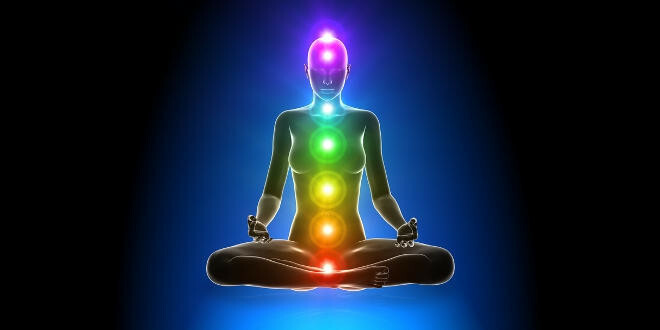 Our being consists of several energy bodies that are connected through special energy vortices called chakras. They are clearly alive, intelligent and full of awareness. Chakras are located in the center of our physical body and play a distinctive role in our well-being. When one of these energy centers is blocked, it creates an imbalance which is manifested on the physical level as a disease. Each chakra has a unique name and colour. They look like small wheels or flowers, but you can visualize them by giving them any shape you prefer. Root chakra – This first chakra is located at the base of your physical body and is red in colour. Its role is to keep us grounded on this earth. It also gives us strength and a sense of security. Sacral chakra – This second chakra is located in the lower abdomen, between the root chakra and the navel and is orange in colour. It energizes our sexual organs and prepares the womb to receive life. Solar plexus chakra – This third chakra is located just above the navel and is yellow in colour. This chakra energizes the pancreas, stomach, liver, gall bladder, and adrenals. This is also the place where we hide our emotions, anxieties and fears. Hearth chakra – This fourth chakra is located just above the heart and is emerald green in colour. This chakra energizes your heart and lungs. It is the place where love, joy and gratitude are manifested. Throat chakra – This fifth chakra is located at the throat level and is sapphire blue in colour. This chakra energizes your throat, mouth and tongue. It liberates words and enables communication. Brow chakra – This sixth chakra is located in the centre of the head at the level of the space between the brows, also called the “third eye” and is purple in colour. This chakra energizes our entire head, including our eyes and ears. It fosters our psychic abilities in order to become a clairvoyant or clairsentient. Crown chakra – This seventh chakra is located at the top of the head and is white in colour. This chakra energizes our brain and glands. Its energy touches the celestial roots and connects the “All There Is” to our own being. It is important to keep all chakras balanced so they can function properly. How do you do this? Here is a very simple meditation technique that will help you do just that! Find a quiet and secluded spot and sit on a comfortable chair. Close your eyes and relax. Take one deep breath, focusing on expanding your abdomen and slowly breathe out. Repeat two more times and then continue to breathe normally. Imagine a waterfall starting high above you and water entering exactly through the top of your head. This pristine water is flowing down and washing away all impurities from each chakra as it flows from the crown downward to the root. See the water continue to flow out of the root chakra down to your feet and into Mother Earth. Now that you have cleansed your chakras, they are ready to be balanced. Next visualize two separate streams of energy flowing in opposite directions through your chakras. 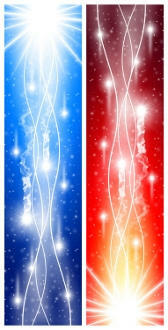 a) Stream of energy going down: Very similar to the chakra cleansing, this time visualize not the water but pure white light entering your crown. The light flows downward and dries each chakra one by one going all the way through the root chakra and into Mother Earth's core. b) Stream of energy going up: Feel that you are connected to Mother Earth. Visualize Her energy coming up to your feet, through your root chakra and upward to your crown chakra. Let the energy pass through the crown and continue to flow into the Universe. Feel both of these parallel streams of energy flowing through you continuously and at the same time. This continuous flow of opposite streams will open and expand your chakras enabling you to receive more and more energy. Continue this meditation until you feel that all of your seven chakras are perfectly balanced. The feeling most people experience at this point is the sensation of warm calmness and relaxation. When you are ready, imagine your chakras returning to their normal size. Take a couple of deep breaths, open your eyes and express your gratitude to the Universe for this wonderful experience.